This book investigates central issues in the philosophy of memory. Does remembering require a causal process connecting the past representation to its subsequent recall and, if so, what is the nature of the causal process? Of what kind are the primary intentional objects of memory states? How do we know that our memory experiences portray things the way they happened in the past? Given that our memory is not only a passive device for reproducing thoughts but also an active device for processing stored thoughts, when are thoughts sufficiently similar to be memory-related? The book defends a version of the causal theory of memory, argues for direct realism about memory, proposes an externalist response to skepticism about memory knowledge, and develops a contextualist account of the factivity constraint on memory. The book consists of three parts. The first part (chapters 2–4) elaborates and defends the causal theory of memory. 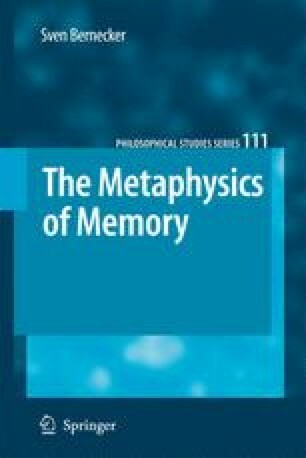 The second part (chapters 5–7) argues for direct realism and sets forth an externalist account of memory knowledge. The third part (chapters 8–10) develops a contextualist account of the truth conditions for remembering.